All RAPIDCOOL parts are specially designed to make your misting system go together with minimal work. They will give you the best possible result for heavy duty use and a trouble free system. We have taken our many years of experience and put together a vast selection of parts and fittings at economical prices. 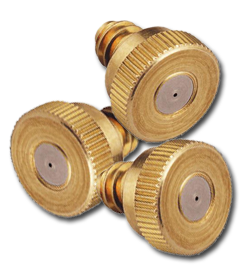 Call Rapid Cool at 818-519-2818 or fill out the form above to tell us about the misting nozzles you need. Rapidcool prefabricated mist line is our mark of quality. This type 316L High pressure stainless steel tube is rated to 3000 PSI and is the ultimate for quality and value. Prefabricated nozzle spacing is available to match the application. Custom spacing is also available. Mist line can be painted to match the surroundings or powder coated in many stock colors. 20 ft lengths are the standard (must ship by common carrier) cut to sizes under 108 inches can be shipped by UPS. Nozzle weld fittings are available in 10/24 nozzle thread sizes and tube can be bent with a standard tube bender. Call Rapid Cool at 818-519-2818 or fill out the form above to tell us about the mist fogging nozzles you need. Made of virgin nylon this VU protected tube will withstand the most demanding sunlight conditions. With a working pressure of 1000 PSI makes it the first choice of the professional or do it yourselfer. 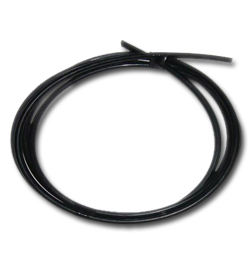 This tube can be fitted with simple Push Loc fittings or Compression Fittings without using internal reinforcements. Available in cut lengths, or 100, 500 or 1000 FT rolls. Call Rapid Cool at 818-519-2818 or fill out the form above to tell us about your water mist system and tubing you need. If you need to direct the misting nozzle away from an object such as a wall or other obstruction, then the nozzle extender will do the job. This is a simple solution to remedy a problem. The nozzle extender is great for fire pits or landscaping and snaking through a water fall or other yard feature where mist is desired. For mist fog from trees or large plants. It can be hidden since it is so small and can be painted or just left raw copper and it will patina to a soft green on its own. Nozzle extenders can be made up in any length up to about 8 feet. Available in both 10-24 or 12-24 thread sizes or can be mixed to convert to other thread size. Call Rapid Cool at 818-519-2818 or fill out the form above to tell us about your water mist system and we’ll help you find the fitting your system requires. 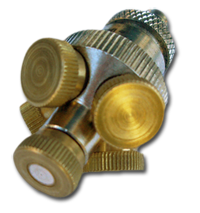 A solid brass fitting that will hold one 10-24 nozzle, nozzle cluster or nozzle extension for use with our 1000 PSI black tube. Simply cut tube and push into fitting for a leak free connection. This fitting works well in landscaping for direct burial with extensions for special landscape effects. Works well in water features to use as a distribution point for several nozzles. Only available in 10-24 threads and 3/8 tube size. Call Rapid Cool at 818-519-2818 or fill out the form above to tell us about your mist fogging system and we’ll help you order the right fitting. Five nozzles from one outlet. 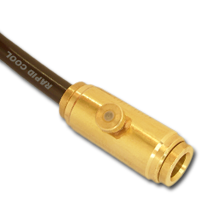 This fitting can be used on a nozzle outlet or on the end of an extension to create more mist than one nozzle. Or, you can adjust the amount of mist by plugging one or more of the nozzles. Available in both 10-24 and 12-24 threads. Call Rapid Cool at 818-519-2818 or fill out the form above to order the misting nozzle cluster.